Can we influence the natural aging process of the skin or the greying of our hair through what we eat and drink? Nutritionalists and dieticians assure us it is possible, up to a certain point. We are advised to eat five portions of fruit and vegetables a day and where this is not possible, to turn to dietary supplements. The effects of this should not only be noticeable on the skin, but throughout the whole body. Can food make us look younger? It has been proven that a healthy lifestyle can delay the aging process. When it comes to the diet, fast-food, sweets and fizzy drinks can certainly not provide the body with the essential vitamins, trace elements, minerals and amino acids it needs. Proof of this can be taken from the food pyramids and charts which have been complied by various organisations, such as the British Nutrition Foundation and the World Health Organisation. The emphasis is always on the benefits of the regular consumption of fruit and vegetables, grains, pulses and dairy products. Meat has a tendency to have a much less prominent position and sugary and fatty foods (especially foods containing saturated fats) are frowned upon. Anti-aging food does not have to be expensive or extravagant. Nowadays, there are organic foods on sale at reasonable prices in almost every supermarket. Organically produced food is more nutritious in general and is less likely to be contaminated. As long as you concentrate on the key nutrients, it can be quite cost-effective to shop in this way. Nowadays, if the body does not get the nutrients it needs, due to poor eating habits such as from stressful work situations or long spells of illness, dietary supplements can provide support. This is important, as the natural aging process is promoted by the so-called free-radicals. These destroy cell structures through oxidation processes which allow the cells to continue ageing inexorably. Beauty products can only effect the skin externally, but the true causes of ageing are actually found within the cells. One of these causes is nutritional deficiencies. Even though the beauty industry loves to suggest otherwise, the ageing process is not reversible. Prevention is therefore the key. I really was interested to know whether free radicals (which are said to be responsible for skin ageing) had always been around, or whether they were in fact a marketing invention. The fact is that they have always been there, but what differentiates them from before is the amount of aggressive radicals. Free radicals can attack through metabolites, but also through smoking or air pollution in cities for example. Their enemies are the so-called antioxidants. These can take the form of hormones, vitamins or amino acids. With their help, cell damage can be prevented and the aging process can be slowed. Well known anti-ageing properties found in nature are selenium, sulphur, zinc, vitamins C and E or beta-carotine. If you think about how you add the antioxidants to your diet yourself, the ingredients have to be supplied in the correct quantities, just like when you are preparing your favourite dish! This is because heating up and processing lowers the antioxidant value, which is why canned food is not as nutritious as fresh food, for instance. By comparison, frozen food is not nearly as affected. The rule of thumb is that the more processing stages there are between the harvest and consumption, the lower the nutritional content in fruit and vegetables. 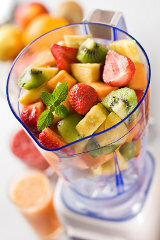 You should therefore try to eat at least 250g of raw or unprocessed fruit and vegetables a day. If this is not possible, vitamins and amino acids can be taken as dietary supplements, as long as they are high in quality. Obtaining enough fluid is also extremely important- Two to three litres of still mineral water can do wonders for the skin and helps it retain its elasticity. Dehydration can certainly make itself evident on the skin. Other liquids should also not be classified as substitutes, for we need water, water and more water! It is doable when you put your mind to it though!